To mark the 150th anniversary of Lincoln’s assassination, here’s Steven Wilson of the Abraham Lincoln Library and Museum with one of the most special artifacts in the LMU collection. Lincoln Memorial University and the Abraham Lincoln Library and Museum will host the fourth “War in the Mountains” symposium April 17-18 as part of the ongoing commemoration of the Civil War Sesquicentennial. This event is free, but registration is required by April 9 due to limited seating. This event also features a Q&A session, tours of the Abraham Lincoln Library and Museum vault, and a book signing by the speakers. The sessions will be held in LMU’s Hamilton Math & Science Building, Room 100. To register or for more information, call the museum at (423) 869-6235 or e-mail Carol Campbell at carol.campbell@lmunet.edu. The first 150 registrants will receive a free gift. The newest exhibit at Lincoln Memorial University’s Abraham Lincoln Library and Museum opened this week. “Clouds and Darkness Surround Us”: The Life of Mary Todd Lincoln examines the tragic fate of Lincoln’s widow, and features original costumes from Steven Spielberg’s Oscar-winning film alongside additional material from the ALLM collection. This exhibit runs through November 20, 2015. In conjunction with the exhibit, the museum is hosting a number of special events, including a screening of Spielberg’s film and presentations on the history of Lincoln in the movies. For more information about the exhibit and upcoming events, visit the ALLM website. Lincoln Memorial University (LMU) will confer the degrees of 335 graduates on Saturday, December 13, 2014, during its annual Winter Commencement Exercises. Lincoln scholar and Howard University Professor Edna Greene Medford will deliver the commencement address during the ceremony. The ceremony is set for 11 a.m. at Tex Turner Arena. A total of 41 associate’s degrees, 133 bachelor’s degrees, 148 master’s, 10 educational doctorate and three doctorates of juris prudence degrees are expected to be awarded. Nearly 375 graduates will participate in the ceremony, including several graduates whose degrees have already been conferred. LMU will present Medford with its highest honor, the Lincoln Diploma of Honor, during the ceremony. Medford is professor and chairperson of the Department of History at Howard University, in Washington, D.C. She specializes in 19th century United States history and teaches courses in the Jacksonian Era, slavery and Civil War and Reconstruction. She lectures widely to community groups and at universities around the country and abroad. Medford is a frequent contributor to C-SPAN historical programs, and has been featured on several programs hosted by the History Channel and other networks and National Public Radio. Medford’s publications include co-authorship of The Emancipation Proclamation: Three Views and Historical Perspectives of the African Burial Ground Project; New York Blacks and the Diaspora, (which she edited). She has authored more than two dozen book chapters and journal articles on nineteenth century African Americans, Abraham Lincoln and race in America. She has just completed the monograph Lincoln and Emancipation, which is scheduled for publication in May 2015. Medford is a member of several advisory boards dedicated to the study of and promotion of Civil War history, including the Lincoln Bicentennial Foundation, the Ulysses S. Grant Papers, the Abraham Lincoln Association, the Abraham Lincoln Institute, the Lincoln Studies Center at Knox College, President Lincoln’s Cottage Scholars Advisory Group and the Lincoln Group of the District of Columbia. The Abraham Lincoln Institute for the Study of Leadership and Public Policy and The Duncan School of Law are pleased to present the R. Gerald McMurtry Lecture. The 2014 McMurtry Lecture is scheduled for Friday October 24, 2014 from 11:00 a.m. to 12:30 p.m. in the Abraham Lincoln Library and Museum’s Arnold Auditorium. The subject of this year’s lecture is “The Emancipation Proclamation to the March on Washington” by Dr. Orville Vernon Burton, a prolific author and expert on the South and race relations. Burton is Creativity Professor of Humanities, Professor of History, Sociology, and Computer Science at Clemson University, and the Director of the Clemson CyberInstitute. His books include The Age of Lincoln (2007) and In My Father’s House Are Many Mansions: Family and Community in Edgefield, South Carolina (1985). Burton obtained his Ph.D. from Princeton University. He was the founding Director of the Institute for Computing in Humanities, Arts, and Social Science (I-CHASS) at the University of Illinois, where he is emeritus University Distinguished Teacher/Scholar, University Scholar, and Professor of History, African American Studies, and Sociology. He is a Senior Research Scientist at the National Center for Supercomputing Applications (NCSA), where he was Associate Director for Humanities and Social Sciences. He is also vice-chair of the Board of Directors of the Congressional National Abraham Lincoln Bicentennial Foundation. His honors and recognitions include: selection as the 1999 U.S. Research and Doctoral University Professor of the Year, the 2004 American Historical Association’s Eugene Asher Distinguished Teaching Prize, the 2006 Campus Award for Excellence in Public Engagement from the University of Illinois, appointment as an Organization of American Historians Distinguished Lecturer, and election to honorary life membership in BrANCH (British American Nineteenth-Century Historians) and the Society of American Historians. He has served as president of the Southern Historical Association and of the Agricultural History Society, and was one of ten historians selected to contribute to the Presidential Inaugural Portfolio by the Joint Congressional Committee on Inaugural Ceremonies for 2013. The Abraham Lincoln Library and Museum (ALLM) will host Lincoln scholars from around the country for the 2014 Lincoln Symposium April 4-5, 2014, in Harrogate, Tenn. Entitled “Lincoln and the War,” the symposium will address issues facing Lincoln during his administration as a war president. Featured speakers include Warren Greer, director of Kentucky’s Lincoln Heritage Trail Alliance, Dr. Anne Marshall, professor of history at Mississippi State University; Dr. Brian McKnight, professor of history at University of Virginia at Wise; Dr. Daniel Stowell, director and editor of The Abraham Lincoln Papers; and Frank J. Williams, retired chief justice of Rhode Island Supreme Court. The program will open with a banquet featuring McKnight as the keynote speaker on Friday evening. Saturday will open with a continental breakfast followed by the four remaining speakers and a panel discussion to close the symposium. Each speaker will discuss a different aspect of the Civil War and how Lincoln managed it. Registration for the symposium is open. The cost to attend the entire program is $60, or $25 for the Friday banquet and $35 for the full-day session on Saturday. For more information or to register, contact Program and Tourism Director Carol Campbell at 423.869.6439. The Abraham Lincoln Library and Museum is located on the historic campus of Lincoln Memorial University in Harrogate, Tennessee. Housing one of the top five Lincoln and Civil War private collections in the world, the Museum is open Monday-Friday from 10 a.m. to 5 p.m., Saturday from noon to 5 p.m. and Sunday from 1 p.m. to 5 p.m. For more information about this and other programs at the Abraham Lincoln Library and Museum, call 423-869-6235. As we’ve mentioned before, LMU’s Abraham Lincoln Library and Museum has put together a special exhibit on technology in the Civil War at the Ford’s Theatre Center for Education and Leadership in Washington, D.C. This exhibition will remain open through July 6, 2014. We asked Steven Wilson, ALLM’s curator and assistant director, a few questions about the exhibit. How did the idea of setting up a temporary exhibit at Ford’s Theatre come about, and why did you pick technology in the Civil War as a topic? The Ford’s Theatre Society saw images of the exhibit on the museum web site. They thought it would make an ideal subject for a temporary exhibit. How do you go about selecting artifacts and images for an exhibit like this? We based our selection of images and artifacts on what we had available in the collection, the story we felt necessary to tell, and what we could borrow from other sites. The story changed somewhat as we modified our approach. The theme never changed—how technology changed the process of war. What will visitors see? Did you use any objects from other collections? We expect visitors to see the transformation in America based on the advancement and refinement of machinery. Our purpose was not to provide them with an in-depth view of technology, but rather a headline news approach. From that they can conduct their own examination of the subject. In order to get a clear and at least relatively straightforward view, we felt it was necessary to have some key artifacts in the exhibit. We approached the National Firearms Museum, the Kentucky History Museum, the Tennessee State Museum, the Ohio River Museum, and the Southern Museum for Civil War and Locomotive History. The items we borrowed, such as a lever-action Henry rifle, a model of a steamboat, and the components of a telegraph, provided us with a look into various elements of the subject. Any exhibit is a cooperative adventure and will only succeed with generous partners. In your opinion, what was the most significant technology to come into use during the Civil War? In my opinion, ironclad warships changed the course of warfare forever. 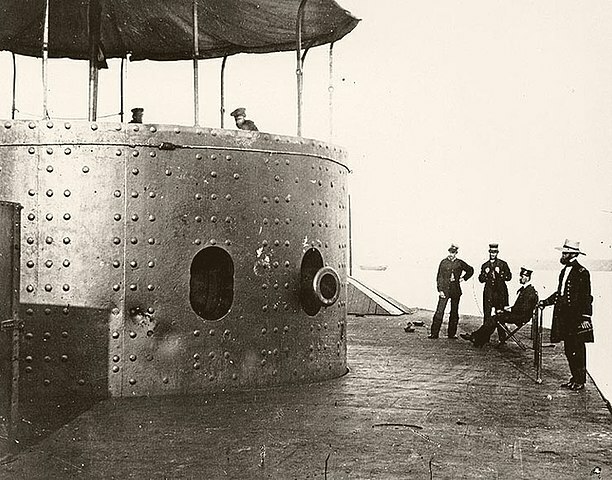 A good argument could be made for balloons, the telegraph, railroads or other innovations, but the battle between the Virginia and the Monitor changed the course of war at sea in a matter of hours. There were ironclads before the Civil War, but they were traditional ships covered with armor. Monitor and Virginia, despite their limitations, shattered the notion that wooden warships ruled the waves. How decisive was the Union’s industrial edge in terms of the war’s outcome? Gallantry, loyalty, honor, and courage are words often, rightly or wrongly, associated with war. It’s difficult to generate patriotic fervor in the heat of smelted metal, standing downwind from a phalanx of belching smokestacks, or in a factory floor surrounded by rows of clanking machines. But it is equally war. The South had approximately 100,000 factory workers, while the North had 100,000 factories. It was like an industrial avalanche scouring chivalry from Southern lands. To quote Rhett Butler, the South has nothing but “cotton and arrogance.” A little harsh, perhaps, but one must remember that the Civil War was the first war of machines in a land of machines. Is it accurate to call the Civil War a modern war? The Civil War is certainly the first modern war, and its placement in history almost ensures it would have been. Machines had been cultivated to serve their masters, and many nations, embracing the potential of industry, committed themselves to the modern art of manufacturing. Look at what came as a result of impending war, or war itself. The Colt revolver, telegraph, ironclad, balloon, revolving turret, Spencer rifle, Henry rifle, Gatling gun, torpedoes, landmines, rifled cannons, submersibles, self-contained ammunition, and thousands of inventions that ranged from the ridiculous to the nonsensical. There was an Industrial Revolution, and while no government fell directly from its emergence, it destroyed the status quo, reshaped society, and increased the capability of soldiers to kill one another. What was Lincoln’s relationship with military technology as commander-in-chief? How active was he in the implementation of new tools to wage the war? Abraham Lincoln was born with a quiet, natural curiosity. He was drawn to learn how things worked, and his strong methodical mind led him, as he said, “to get to the nub of the problem.” He was an inventor, although he might be classified more as a tinkerer, and it was reported that during travels on the circuit Lincoln would stop and examine farm machinery so that he had an understanding of how it worked. When President Lincoln read of, or saw, or was presented with machines that might reduce death on the battlefield, give the Union an advantage, it simply fascinated him, and he expected his generals to share his enthusiasm. Mostly, generals did not. Lincoln felt the Spencer repeating rifle had possibilities, and said so. He pushed the acceptance of the Monitor when his naval advisors thought the despicable thing nothing more than unholy. He would have climbed into Professor Lowe’s balloon for a bird’s eye-view of the countryside, but the aghast Stanton forbade it. Here is why Lincoln’s approach is important: his goal was to win the war and unite the nation. He was not deterred by the super-heated enthusiasm of inventors, or the outrage of Ordnance Department officers. He wanted in his hand a device to stop the killing. A lightning bolt would do, but Lincoln would settle for a new repeating rifle. Any plans to have the exhibit travel elsewhere after it closes at Ford’s? We’ll have the graphics available for a traveling exhibit late this year. Finally, what’s your favorite artifact in the exhibit? My favorite artifact in the exhibit is the model of the U.S.S. Monitor made by that ship’s crew and given to their captain, John Worden. Not only is it a remarkable historical artifact, it’s a token of the crew’s respect for their captain.